Haul: TBS & More Stickers!! Judging by the title of this post, a shocked reaction or a teensie gasp is expected from all of you. Yes, it is another haul post. I'm on a roll here!! Well, on a roll to empty my wallet, probably. Anyway, before I start to type various un-haul-related things, let's just begin with pictures. Don't you just love pictures? I went to The Body Shop to look for new fragrances to use with my aromatherapy device that I've showed in my previous post. As I got to the store, I was quite surprised that they've already got the new packaging for the essential oils. I've seen CherryChan108 do a review on the 'Sandalwood & Ginger' one in this new packaging and was intrigued to buy a new one. I got 2 scents that my bf and I quite like. My first pick was the 'Tuberose & Orchid' home fragrance oil. To me, it smells like roses that has morning dew on it (not the drink!). I let my bf pick which one he wanted and he picked this up. I was kinda scared of the scent because it smells like going to a funeral where everything just reeks of jasmine. Well, at least in Indonesia, people use jasmine as a funeral/burial flower. So, I guess I won't be using this when I'm home alone, but I do like the scent! This is the older packaging of the home fragrance oil from The Body Shop. I prefer the bottle from the older version, but loving the new sticker on the recent bottle. I know what you're thinking, more stickers. What the hell is wrong with me? Nothing is. It's just that I'm into making a scrapbook like I used to back in high school. I'm getting older and I want to cherish my memories while I still can. That, and I have loads of free time. I found these cute self stick notes that you can bookmark your books with. I was looking for a dog version, but all they have is a rabbit and a bear version. It's okay, remembering that I'm not really expecting to stumble on to these cute little things. After shopping, we obviously got hungry, so I suggested to try out a new restaurant called Jia something. It's a noodle house where you choose your own noodles, veggies, meatballs, etc. We shared a bowl since my bf is still full from his lunch. As you can see from the picture, it might look like a small portion, but the bowl is pretty deep, so it's quite a mouthful to finish. This is the first thing that I grabbed from the bowl because I am a sucker for fish balls. Not literal fish BALLS. However, I was surprised when my bf pointed out that there's a filling inside. It's quite salty, but I think it's minced fish meat, if I have to guess. It tasted okay, apart from the saltiness level. 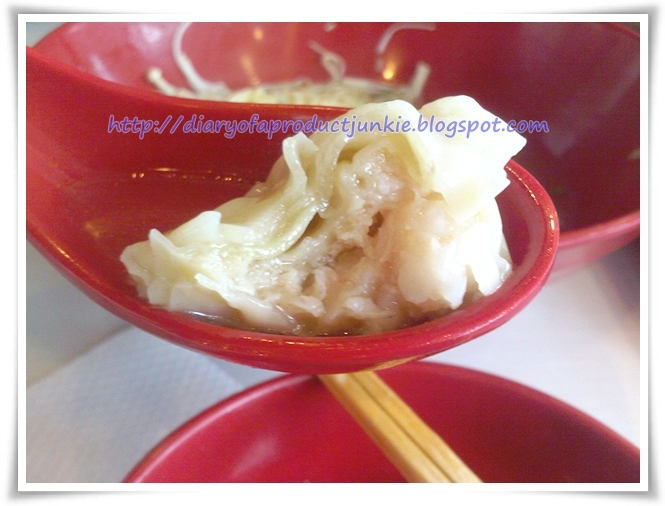 Then, there was this wonton. 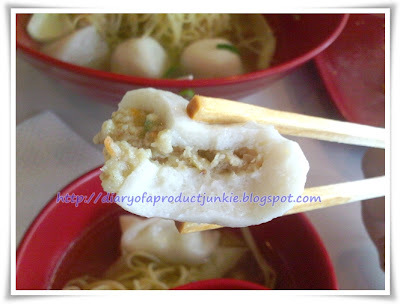 After tasting the fish ball, I had lower expectations for this 'dumpling' to taste good. Yet, I was wrong. 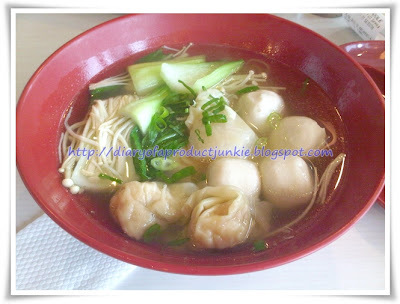 This is one of the yummiest wontons that I've ever tasted. I can actually note the ginger and sesame oil with minced meat in it, which wontons rarely tasted that way now. 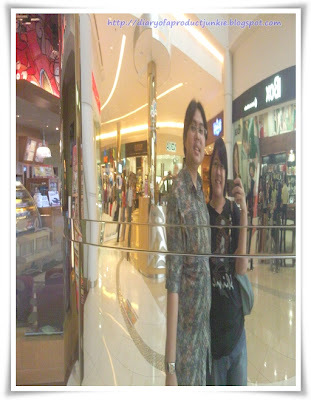 Last picture of the day before we went home from the mall. I took this picture just for fun while waiting for our driver to come. Turns out to be a good picture for someone with shaky hands!